Biochemist Michael Behe, whose testimony figured prominently in the trial. Ted Davis stands behind Behe. Image credit below. Editor’s Note: Ten years ago this week, a trial concluded in Harrisburg, involving the small town of Dover, Pennsylvania, that had a tremendous impact on the science/faith conversation. Ted Davis was at the Kitzmiller v. Dover trial, not only out of personal interest but also because Mark Silk, the editor of Religion in the News, asked him to write an article about the trial and how the press covered it. Ted’s article is reprinted below with permission. The NOVA episode with the same title didn’t come out until two years later, in case anyone was wondering. (Speaking of which, keep in mind that all time-based references are now quite out of date.) Look for further reflections on this anniversary at BioLogos in the near future. Fifteen miles southeast of my office at Messiah College lies the small town of Dover, Pennsylvania, where one of my students ran unsuccessfully in last spring’s primary election to choose school board candidates for the general election in November. Fifteen miles to the northeast lies the Federal Courthouse in Harrisburg, where for six weeks this fall international attention focused on a judicial proceeding that, 80 years after the Scopes “monkey” trial, pitted Darwinian evolution against its latest intellectual antagonist, Intelligent Design (ID). Like Margaret Talbot, whose excellent essay in the December 5 New Yorker is the most extensive eyewitness account thus far, I was a spectator at the trial – though my teaching schedule prevented me from going as often as I would have liked. As far as I know, I was the only academic other than those directly involved in the case who spent more than a day in the courtroom, as well as one whose discipline (the history and philosophy of science) is, if I may say so, the crucial one to assessing the import of the expert testimony. Although Dover didn’t become as big a media event as Scopes, which brought some 250 reporters to Dayton, Tennessee, and was broadcast live over WGN radio in Chicago, it was plenty big enough. The jury box to the judge’s right was filled with reporters, and so were many of the seats in the gallery. Altogether, forty places, roughly half of all seating in the room, were reserved for journalists, and there were more of them in the courtroom on those days when the general public did not claim all of the space allotted to us. Why so much attention? After the 2004 presidential election, newspaper coverage of ID more than tripled, suggesting that the theory had come to be seen by journalists as a central preoccupation of the “moral values” coalition that helped to re-elect President Bush, and that with the election over, ID had become a central front in the ongoing culture war. That impression was strengthened at the beginning of August, when the president told a group of reporters that he thought ID should be taught in the public schools along with evolution. To most of its adherents, creationism means what is usually called “young-earth creationism,” a term in which the first term is no less important than the second. Adherents believe, based on a literal reading of Genesis, that God created all things in less than one week, just a few thousand years ago, before taking a day off. They also believe that God would not have allowed sentient beings (animals capable of feeling pain) to suffer before sin entered the world – before, that is, humanity “fell” as a result of Adam and Eve disobeying God in the garden of Eden. No suffering, for them, means that no animal died from disease or carnivorous activity in the original creation, which in turn leads them to conclude that animal anatomy and behavior, along with some aspects of physical nature, changed fundamentally after the Fall. And since there was no animal death prior to Adam and Eve, fossils cannot be the remains of creatures that lived and died before humans existed. Instead, young-earth creationists claim that virtually all fossils were formed by a single event: Noah’s flood. Extinct creatures bear witness not to the evolution of life on earth but to the Flood, and thereby to the truth of the Bible (as the creationists interpret it). The young-earth creationist position is driven entirely by religious concerns and was properly ruled to be a form of religion, not science, by the late Judge William Overton in McLean v. Arkansas Board of Education, a case challenging an Arkansas law requiring “balanced treatment” for “creation science” and evolution nearly a quarter-century ago. A key witness who helped the judge reach this conclusion was philosopher Michael Ruse, who argued that creationism isn’t science because it’s just a set of religious beliefs that can’t be tested observationally, and science must be capable of observational tests. Ironically, right after the trial, several other philosophers of science “took immediate umbrage at the suggestion that one can draw a sharp line between science and the rest of human activity,” as Ruse puts it in his latest book, The Evolution-Creation Struggle. Creationism is testable, his philosophical critics said, and it has failed those tests. It is science, just bad science and therefore should not be taught. Although McLean is based partly on Ruse’s debatable proposition, the precedent was established. Indeed, in his ruling, Judge Jones cites the very part of Judge Overton’s decision in question. But Ruse’s critics were onto something important. Creationism is seen by its adherents as a “theory” on the same level with evolution – an unproved explanation for the origin of the universe and every living thing. ID, by contrast, does not purport to be such a theory. It does not, for example, offer an answer to such questions as how and when dinosaurs came into existence. It is not a strength of ID that it avoids offering a grand narrative. As the late Thomas Kuhn argued, scientists do not abandon an existing paradigm unless or until they see a better paradigm out there to embrace. I am convinced that, without such a paradigm, ID will never be regarded as science, not even bad science, by the scientific community. But in order for ID to provide a plausible alternative to evolution, its proponents would have to address the one issue they least want to face: the age of the earth and the universe. Their refusal to discuss this issue directly and publicly has less to do with science than with movement politics. Currently, the ID movement is, to use its own language, a “big tent” under whose sprawling canvas there is plenty of room for differences of opinion about theological and biblical issues related to the age of the earth. A full public discussion of these issues would not disturb most of the intellectual leaders of the movement. But it would alienate the many grass-roots creationists who support ID – and who provide it with much of its political support. So while ID is not creationism, creationism remains the elephant in the room. Judge Jones evidently smelled the elephant quite distinctly. At this point, there simply is no ID “theory” to teach – or even to practice in the laboratory, let alone to place at the center of a new scientific paradigm. ID currently consists only of an interesting philosophical critique of the explanatory efficacy of Darwinian evolution, combined with an appeal for scientists to add “design” to the set of explanatory principles they employ in biology and other sciences. When ID advocates say, “teach the controversy,” they do not mean that ID should be taught as an alternative to evolution, in the same sense in which the authors of the Arkansas bill wanted creationism taught as another theory of equal merit to evolution. Rather, they are referring mainly to ID’s criticism of evolution as it is presented in textbooks: They want students to learn that some scientists do not accept important aspects of the standard picture of evolution. After hearing all the testimony about ID, the Judge concluded that the “tactic” of teaching the controversy “is at best disingenuous, and at worst a canard. The goal of the [ID Movement] is not to encourage critical thought, but to foment a revolution which would supplant evolutionary theory with ID.” While I agree with the latter part of the Judge’s second sentence, I must dissent from the rest. Having taught courses on aspects of the “origins” controversy at high school and college levels for almost 25 years, I am convinced that it enhances critical thinking and the understanding of science for students to be taught about various objections to evolution. As I tell my students, scientific knowledge is determined not only by observations and experiments, but also by the outcome of debates about how to interpret observations and experiments; and these debates involve a variety of factors. Where religious belief is one of those factors, it serves a secular academic purpose to talk about it in a biology class. A crucial ID claim, advanced by Behe in Darwin’s Black Box (1996), is that a few biological structures are “irreducibly complex.” This refers to the idea that a given structure has too many closely interrelated parts for its first appearance on the scene to be explained by unsupervised Darwinian mechanisms that could not have foreseen its function and planned accordingly. This is where religion comes explicitly into the controversy. Because ID advocates decline to spell out a specific alternative to naturalistic assembly by Darwinian mechanisms, the scent of miraculous divine activity is always in the air – and at the Dover trial, biologist Kenneth Miller did his best to concentrate it into an essence. The first witness for the plaintiffs, Miller is an author of the textbook used in Dover High School and thousands of other schools nationally. Calling upon arguments he made at length in his 1999 book, Finding Darwin’s God, Miller made it clear that ID is not creationism in the ordinary sense, it is nevertheless a type of special creationism, because it strongly implies that some biological structures or even entire organisms have been miraculously assembled. (I said the same thing myself in an article in Christian Century in 1998, and I still think so.) Judge Jones was persuaded. This, however, only begs the question of whether or not ID advocates are right about the inadequacy of Darwinian mechanisms to explain things like the bacterial flagellum. If they are, let us hope that the truth can be taught in biology classes, whether or not it has religious implications. Behe and Miller are both genuine experts on aspects of cell biology, and they simply do not agree about how to interpret the evidence. They did not agree when they both spoke on my campus several years ago, they have not agreed when I have heard them speak at the same academic conferences, they do not agree in their essays in the recent volume Debating Design, and they certainly did not agree when testifying in Harrisburg. For me, this has become a case of “he said, he said” that will not be settled by listening to either of them one more time. I lack the competence in the relevant science to sort it out. I doubt that Judge Jones knows any more biochemistry than I do, but he obviously found Miller a more persuasive witness. In thinking about the larger cultural issues, however, I am reminded of something that philosopher Niall Shanks said at a symposium on ID last spring. The ID advocates and the mainstream scientists are looking at a glass that is either half full (mainstream science) or half empty (ID). Each side is placing their bets on a different outcome, once all the facts are in. Shanks is no friend of ID, and I take his description as a tacit admission that Behe and company are making some valid points about the present state of knowledge. At the same time, it does seem a little imprudent for ID advocates to float an enormous, wide-ranging program of cultural renewal on half a glass of water. No doubt about it, cultural renewal is a large part of the ID agenda. Philosopher Barbara Forrest, another key witness at the trial, has documented this thoroughly in her book, Creationism’s Trojan Horse, which calls attention to a document lifted from a computer owned by The Discovery Institute, the Seattle think tank that funds most of the work done on ID. This “Wedge” document, as it is called, was probably an internal white paper circulated to potential donors to garner support for ID projects. It explains more succinctly the same strategy that is presented in The Wedge of Truth: Splitting the Foundations of Naturalism, one of several books on ID by retired law professor Phillip Johnson, the leading ID strategist. Most ID advocates are conservative Christians (some like Johnson are Protestants, others like Behe are Roman Catholics), and many of them do see ID as the key to unlock the stranglehold of an atheistic naturalism on modern America. Mathematician and philosopher William Dembski, whose book The Design Inference is perhaps the most original contribution to ID, believes that ID’s challenge to evolution and naturalism is “ground zero of the culture war.” Judge Jones was impressed with the evidence linking ID to openly Christian efforts to influence the larger culture. I doubt that the rhetoric will cool anytime soon, despite the fact that the Dover case is now over. Certainly, in the wake of the judge’s decision, ID advocates promised to continue the fight across the land. Does this leave open the possibility that a science teacher might still be allowed to discuss aspects of ID? If not, it would be unfortunate. Yet – and this is critical to bear in mind – ideas associated with ID are being advocated in some refereed professional literature related to the philosophy of science, including the journal Biology and Philosophy and several recent books from academic publishers. Some of this literature was mentioned by witnesses for both sides in the trial, but curiously neither side made much of it. Pennsylvania science standards call for teachers to discuss the “nature of science” – which in the language of science education is a reference to aspects of the philosophy of science. The existence of refereed professional literature on ID in the philosophy of science suggests that the approach is relevant to questions regarding the interpretation of data and the formulation of hypotheses. The magazine Nature went even further in an April 28 editorial headed “Dealing with Design,” which stated that scientists in the lecture hall “should be prepared to talk about what science can and cannot do, and how it fits in with different religious beliefs.” Similarly, public school science teachers have a legitimate secular purpose in discussing various philosophical objections to aspects of evolution that have been raised by scientists in the 147 years since Darwin’s book was published. The general education of a science student is well served when such topics are introduced. Still, I cannot criticize the judge for overlooking this possibility, because the defense did not make a case for it. Rather, the defense kept insisting that ID is science, not philosophy of science, despite the near total lack of backing for that claim in the scientific literature. It is worth noting that, in contrast to Scopes, the news media did a more than respectable job in covering the issues at hand. A three-part series in the New York Times in late August stands out in this regard. Jodi Wilgoren’s lead article in the August 21 New York Times was especially well done for its coverage of the politics of science, and all three stories allowed advocates of ID to describe their ideas fairly and clearly in their own words. Cornelia Dean’s August 23 article effectively highlighted various other ways in which American scientists have provided religious (and irreligious) interpretations of science. As for the local newspapers, I found their coverage of the trial and the local circumstances surrounding it to be thorough, accurate, and unbiased. From time to time, the correspondents for these papers consulted me on points raised by the experts, but they invariably knew much more than I did about what took place in Dover before as well as during the trial. Although certain defendants frequently claimed that they had been misquoted or misrepresented by the local press, the trial left the shoe on the other foot: The judge declared that two of the school board members, Alan Bonsell and William Buckingham, had lied in their depositions, confirming my similar impression in court. Judge Jones found that the Dover board violated the Establishment Clause because it acted from religious motives. That should have been the end to the case. Instead, Judge Jones got on his soapbox to offer his own views of science, religion, and evolution. He makes it clear that he wants his place in history as the judge who issued a definitive decision about intelligent design. This is an activist judge who has delusions of grandeur. Someone may be deluded here, but I doubt it is the judge. Notes about cover photo: Ted Davis attended several days of the Kitzmiller v Dover trial, including the first day of testimony by Lehigh University biochemist Michael Behe. 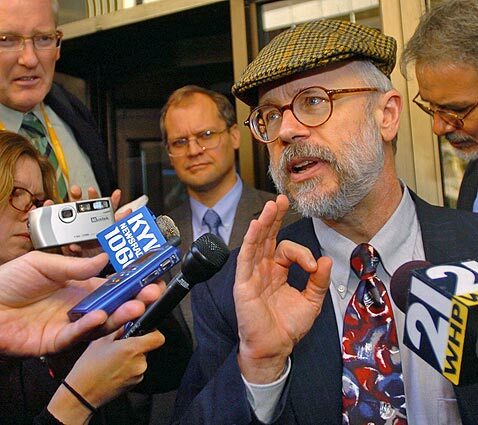 Ted walked out of the courthouse in conversation with Behe, then stepped into the background when the reporters surrounded Behe on the steps just outside the doorway (Image source).